In France there are at least 874 bee species that fall into the broad categories of Bumble bees and Solitary Bees that require a multitude of different habitats for their specific life cycles. This makes them extremely vulnerable to habitat loss, climate change and agricultural practices which is resulting in their decline and local extinctions. Many emerge for a short specific period of time each year in which they mate, lay their eggs and die, not to be seen again until the same time the following year. Firstly it’s as well to deal with the one most people tend to think of, Honey bees, the ones that we put in different artificial constructions the most commonly known being the classic Bee Hive. There are all manner of other artificial homes people make for them and of course being wild they will build their colony in more or less any old cavity. Given the current situation it’s fairly safe to say that they aren’t facing any serious likelihood of decline as long as there are Bee keepers. 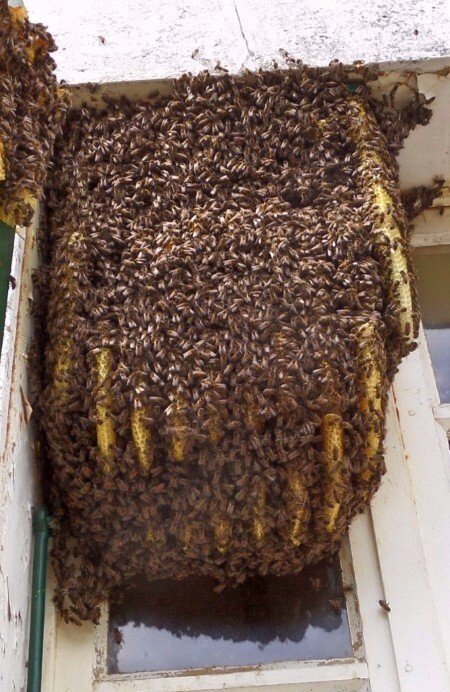 Honey bees are the classic example of a Social or colony forming bee and unique in so much as the colony is continuous and survives the winter. 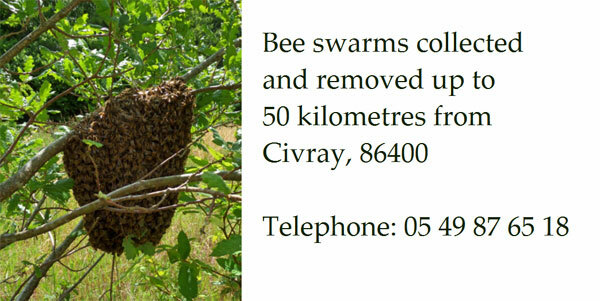 No other type of bee in France does this. 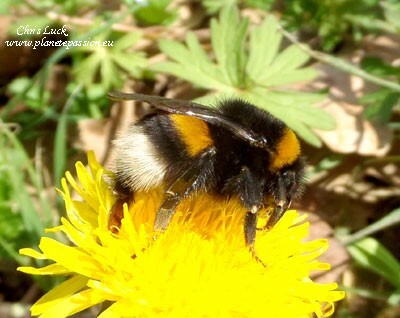 The other group of bees that are social or colony forming are the Bombus species or Bumble bees as they are commonly known or Bourdon in French. 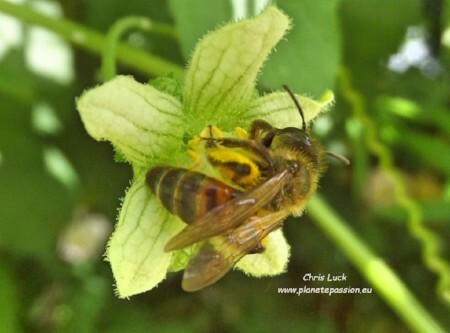 These are the larger hairy bees we see and there are 44 different species of these in France. Workers are generally about half the size of Queens. Bumble bee colonies don’t survive the winter, that’s only for newly mated Queens that have to find somewhere to hibernate before starting a new colony in the spring. Overwinter losses for Queens can be substantial. Moving on to what we call Solitary bees which are bees that don’t form colonies. What this means is that the bees live separate lives and each individual female is a Queen in her own right and having mated independently puts her eggs in her own “nest”. It’s a large complex subject which I won’t pretend to understand in detail with at least 830 different species in France that range from really tiny bees that are almost unnoticeable to the large blue carpenter bee that surely everyone in France knows. 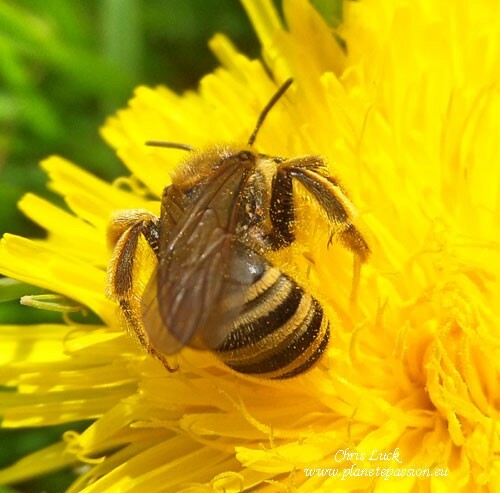 They fall into different behavioural categories according to how and where they construct their nests and are accordingly often refereed to as Miner bees, Digger bees, Carpenter bees, Mason bees, Leaf cutter bees, Wool Carder bees and Carder bees. This type of description isn’t a scientific one that categorises the individual families and species but is none the less widely used and is covered elsewhere. By far the largest number of species make their nest in the ground, most preferring sandy soil although heavier and clay soils are also used. Evidence of them may be seen if you come across tiny little mounds of earth in lawns or other areas of bare or almost bare undisturbed soil and although solitary, females do sometimes construct nests close to each other in large numbers in suitable soil creating the illusion of being a colony and there are even some species such as Halictus-scabiosae that sometimes manifest a primitive social organisation, with multiple females reproducing in a common nest. Most of the bees referred to as mining bees belong to the genus Andrena and there are some 177 species of these known in France. 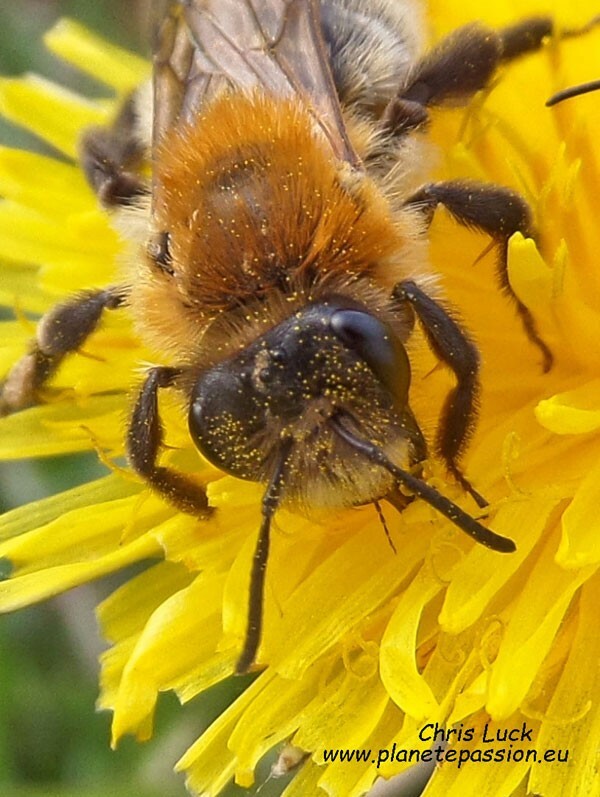 This will all be covered elsewhere but one such relatively common species is the Tawny mining bee, Andrena armata which used to be called Andrena fulva, which has a single flight period each year and is on the wing from March or early April until early June; the males emerging well before the females. Peak activity coincides with the flowering periods of fruit trees such as Pear, Cherry and Apple. Females are covered in fox red hair in bands. Males are much slimmer, covered in less dense orangey brown hair and with a very pronounced tuft of white hairs on the lower face. Nest tunnels can be very deep, usually in full sun with little or no ground cover. 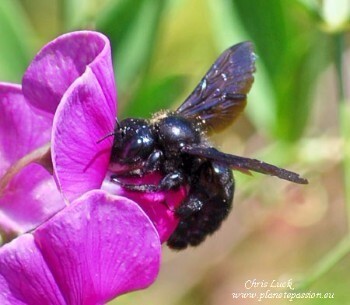 The easily recognised Violet Carpenter bee, the largest solitary species.